I am an international student in America from Nepal. I recently started my own website, Info-Nepal, where I blog about everything about Nepal, its culture, foods, destinations, mountains, you name it and I have got it covered. Nepal is a very diverse country, both geographically and culturally. I came from this very culturally diverse country. You may not believe it, but Nepal is not even the size of Florida but it has over 100 different languages and dialects. Most of the languages are influenced by Indo-Aryan or Sino-Tibetan language families. But, I am not from one of those ethnic communities of Nepal so I only know 3 languages: my native language Nepali, English ( my medium of education), and Hindi (influenced from living in the bordering town of India and Nepal, and some Bollywood movies). I had a lot of friends who came from different ethnic backgrounds so I was used to dealing with their language and culture, their traditions. I used to take part in their festivals and celebrations. It gave me a lot of opportunities to learn about new cultures and traditions. Even after coming from such diverse cultural background, after I landed in America for my masters degree, I got some cultural and technological shocks. Nepal is a developing country but we have everything in Kathmandu. But some things were different here, technologically. Such as, we don’t have fast food restaurants where we can have free refills of sodas like here. When I first went to buy soda, they just gave me a cup and I looked at that cup strangely but my husband who had lived here for several years taught me everything. I got used to with it. I couldn’t open the shower because we had different types of showers back home. Automatic transmission was a new thing for me, because I knew how to drive manual but never automatic cars. The most interesting thing was, people saying ‘Hi’ and ‘Hello’ to strangers on the road as they were passing by. Nobody in my country greets strangers. That was quite a new thing for me. There were many things that was new for me in this new country. I read Bill Belew’s article ‘How to raise bilingual children in 5 steps’ on his daughter’s website and I couldn’t agree more. I have seen many kids among Nepali communities that are ashamed of speaking their own Nepali language when they start going to school. I don’t blame little kids for that, I blame their parents. If you are from different parts of the world, it is your duty and responsibility to teach and raise your child bilingually. Not raising them in this way creates a lot of problems, communication gaps with their grandparents and other folks back home which will eventually lead to a break up of relationship with them. 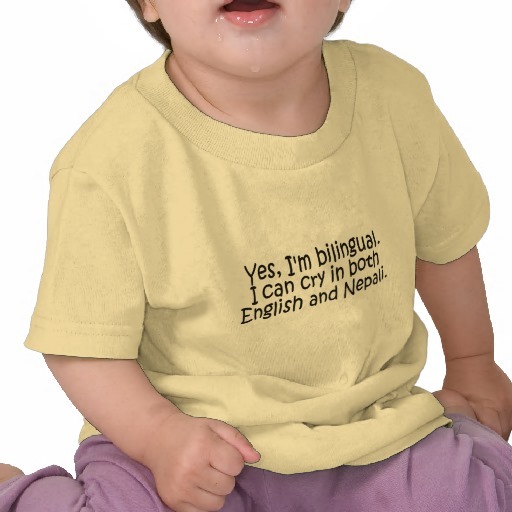 I will definitely teach my kids both languages and will raise them bilingually since I came from a different part of the world where English is not my native language.